Bath time - the one time in my household when I can get Madison to relax and actually be quiet. That's not to say that I don't enjoy hearing her stories over and over again, but when you've heard how she was the class leader about 20 times since she's been out of school, it can get a little tiresome. Don't tell her that though, because she'll automatically think that you're being "mean". Ever since Madison was a baby, she's always enjoyed bath time and I have always tried to make it fun for her. Even if she ends up looking like a prune after being in the tub for much longer than she needs to, she would insist that the water is still warm and that she's not cold. With the introduction of Suave Kids® Disney Collection, it's now almost impossible. How many times have you heard the song "Let it Go" in your own household? What about your children dressing up as Anna and Elsa? 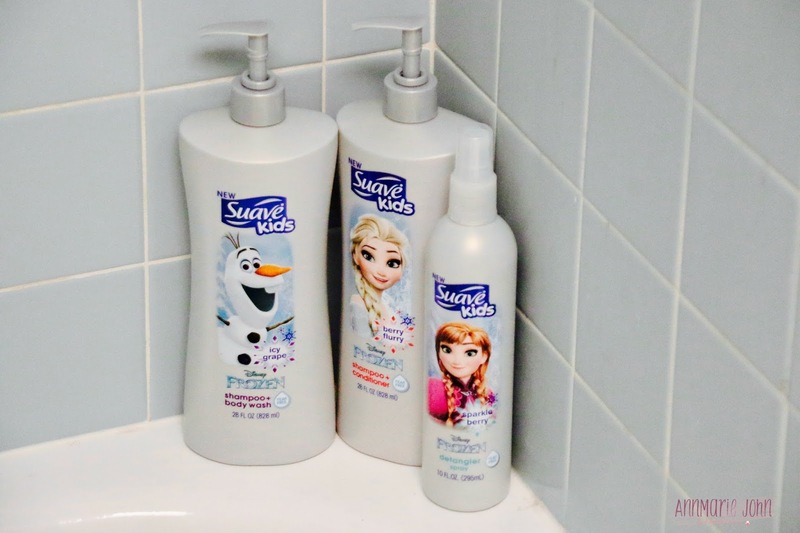 Madison is slightly (ok that is a mild understatement), obsessed with Disney's Frozen characters, so imagine her excitement when she found out that Suave now had her favorite characters that she could use in the bathroom. I have always loved Suave products. My son Kyle actually tells me that I'm pronouncing it wrong and calls it Suavé (sua-vay), because according to him, it's just that good! I have loved their prices that doesn't break my pocket and to be honest, they work just as good, and sometimes even better than the more expensive stuff, but I digress. Madison LOVES her new Suave Kids® Disney Collection. The Disney Frozen Elsa 2-in-1 Shampoo + Conditioner in Berry Flurry comes in a delicious strawberry scent that children will love. Madison used to hate washing her hair because according to her, the shampoo would sometimes burn her eyes. This is tear free! It has a rich, creamy lather that rinses out easily and leaves their hair feeling soft and clean. 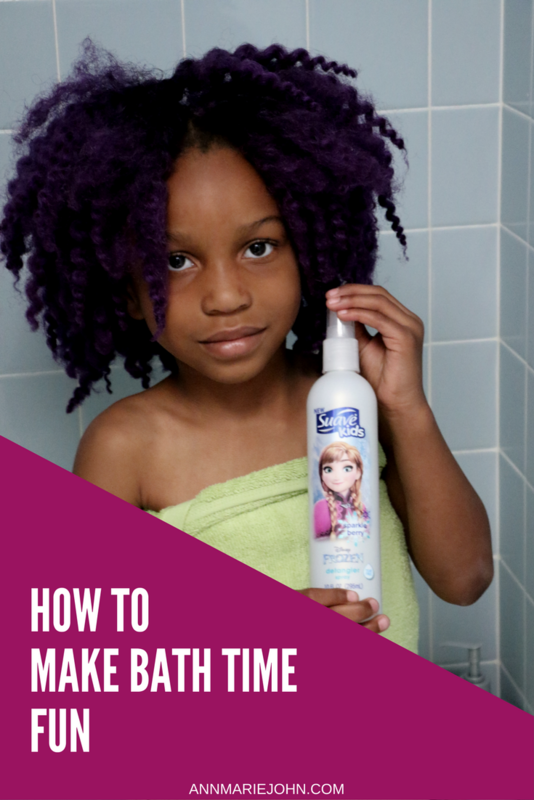 The Disney Frozen Anna Detangler Spray in Sparkle Berry leaves her hair manageable and if you know Madison personally, you'd know that her hair isn't manageable at all. It also leaves it softer than it was before and is great at taming knots and flyaways. While I was a bit wary about using it in her hair since she has extensions in, it worked really well, and I just LOVED the smell. So for those wanting to know, it can be used on any type of hair. Yay! 1. Bath Toys - You're never too old for bath toys. Rubber duckies aren't the only bath toys that are available on the market. You can do foam alphabets and numbers and even making it a learning experience. Add a few and make bath time fun again. 2. Bath Bubbles - Everyone loves a good bubble bath, I mean who doesn't? Even grownups do. 3. Bath Games - Have you ever played iSpy in the bathroom? You'll be surprised at how many items you can spy while taking that bath. They can even role play with their bath toys. Madison just recently had a very long dialogue with Anna, Elsa and Olaf. 4. Songs - Do you have a favorite song that you sing with your little ones, start singing in the bath. After all we're usually the best singers, and everyone's a star when we're in the shower. Any song or songs will do and you don't even have to be pitch perfect. 5. 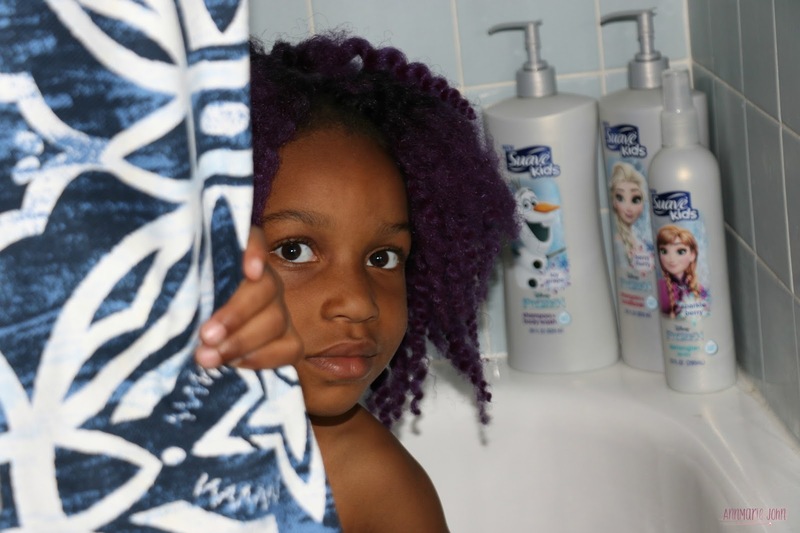 Buy New Bath Products with their Favorite Characters - Suave Disney Frozen Olaf 2-in-1 Shampoo + Body Wash in Icy Grape makes bath time extra special. It comes in a fruity scent that kids just love and it leaves them clean from head to toe. It also leaves them smelling delicious enough to eat as well. This 2-in-1 product is amazing because only one bottle is needed, and it is great for small bathrooms since you don't have many bottles to store. So if you're looking for a new bath time routine to start with your kids, consider the new Suave Kids® Disney collection. They are dermatologist and ophthalmologist tested and available in easy to use pump bottle or squeezable tube. They are perfect for daily use and comes in fun, fresh scents that will leave your kids smelling awesome and clean from head to toe. The Suave Kids® Disney collection is available for sale at Walmart, Target, Mass, Grocery, Drug and Value retailers nationwide. Those are super fun! My niece is SO into Frozen right now and she will love these. That's so cute! I've seen these in Star Wars, too for the more space-minded kid. I love it! That is too stinking cute. Nothing makes kids want to do something like Disney. It's magical. The characterized bath products are so genius. My nieces and nephews HATE bath time. I think they might be coaxed with some Moana or Minion shampoo, though, haha! Super cute! My son LOVES Olaf and he also prunes up in the bath because he stays so long. I am so glad my little one loves bath times. I know some toddlers hate to have bath times but our struggle is getting him out of the bath. My kids already love bath time. You're right, bath products make it more exciting! The prints on the packaging certainly appeal to the kids. Sometimes it can be difficult to get your kids to clean up, hopefully this will make it easier . I love that they make these with Disney characters on them! That makes kids so much happier to bathe. These are really cute bath products! My kids are Disney fans so they would love these. These are definitely some great bath ideas! Things are much easier when the kids look forward to the bath routine. Bath products with Disney characters are perfect! These are good products, and I use several of their products myself. I grew up in Disney's boyhood home, these would be so popular there! These products are so cute. My kids would love the Disney character option. The Suave Kids Disney collection is going to be a big hit with my kids. I will have to pick up some of the Frozen ones for my Daughter. Suave makes fantastic products. These are awesome bath products that I use to stock my guest bathroom! Affordable and does the work! Love it! I had no idea Suave has these adorable characters on their products now! My kids will love them all! 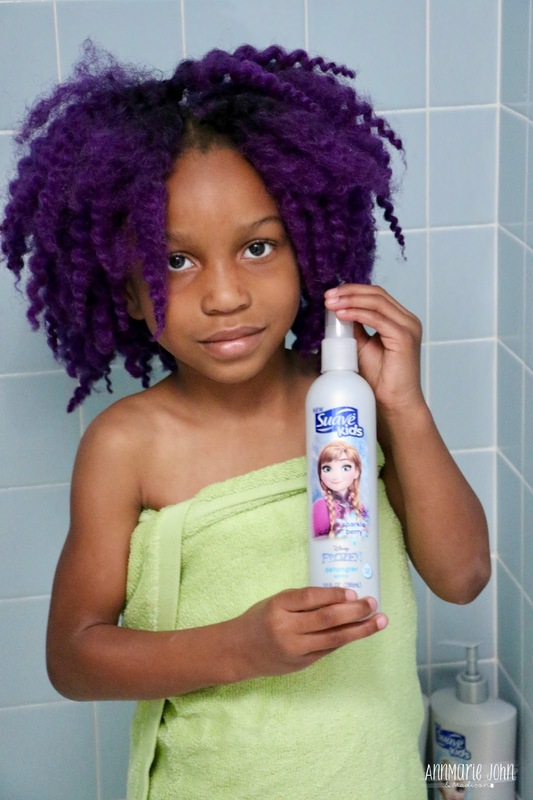 Those "Frozen" Suave Kids shampoo and body wash will be the ones I will purchase for my granddaughter. She can sing Let it Go all she wants in the bath, and live her Elsa dream. These look like some good time bath-helpers to me. Suave products are wonderful! I like that they work well and are very affordable. It's nice that they also have a children's line. Oh, this is amazing! I thought they only have the collection for boys! Totally awesome!! I have been using Suave for my kids for awhile now. I take turns between the Frozen and the Star Wars to make the kids happy. We love Suave Kids products here. They're inexpensive without feeling like it! I actually use their detangler in my own hair. I loved picking out kids shampoo when I was little! They smell so good!!! Also, how cute are those Frozen bottles??? Love! A good bubble bath is like a little paradise, and for the kids it's a fun thing to enjoy. The Disney figures product is such a brilliant idea! I didn't know Suave makes products for kids; that's so awesome! I have to check these out for my kids. As a child i never use to like bath time. Haha I was a nightmare apparently. I loook of the suave products and I will see if I can buy it over here in the UK. Ok first off - I love the purple hair! She is rocking it!!! Secondly, these look like some really fun products! Thanks for sharing. When my daughter was younger this was her favorite shampoo and even now that she is 19 she loves it. Can't beat the price and when there are coupons out there, we stock up big times! Haha! sua-vay. I'm going to start pronouncing it like that! Scarlet doesn't really like baths right now. She's in a phase. The products are beautiful and I like the packaging. I bet it smells good. Good products and bubbles and bath markers help us! Wow! Suave made this and I'm sure a lot of kids will be loving it. Hope they can make other characters too. I love Madisons Purple hair so cute on her and you! I am surprised this worked on extensions as you stated that is interesting to know but great if its helping to upkeep her hair too! i love Suave products! So affordable but so, so good! My mom used to play bath games with me all the time. Also, bubbles were never in question, they were always included haha! Love this idea! My kids will love this. Both of my daughters have super long hair and they need a lot of shampoo and even more conditioner to keep their hair i great condition. I also like that affordability of Suave. I love the FROZEN themed products. Both my daughters strongly dislike washing their hair. But if Olaf is on the bottle I can convince them to do it! She is so cute! Great tips. I passed this along to all of my mommy friends. Wow this are great tips! These Suave products sounds very good. I've been hearing a lot of positive feedback. Frozen is a big favorite of girls all around the world. My girls never got into Frozen like that but I do love Suave products. My little ones love bath time. They ask me to change out the bath toys almost every night to keep it fresh. We also like to facetime with out of state family. I've never got them shampoo with characters on it but that would make their day!